I pulled the trigger and got a tablet. One my old Android I was using NativeBOINC. I loved it, I could use it exactly like BOINC on any PC, including remote control. New appliance I installed the official app. It acts totally different. It does not listen to online settings and I cannot find a way to add a config to be able to remote control it. Has anyone successfully done this? If not I am going to finish up the work it is doing and go back to NativeBOINC until they fix this. So, no one has anything to say. I am now crunching the last items and will move back to NativeBOINC. I like the interface and know I can make it work as I want. 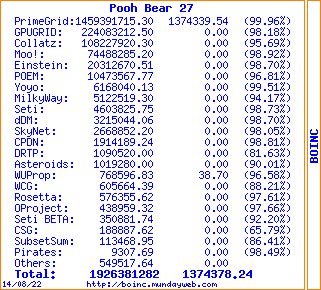 The stats for it when on regular BOINC did show on the NativeBOINC site. I moved over, now I can control it from my main system. So far for a 4 core, it seems like 3 cores run best. 4 gets it a little hotter than desired and causes it to throttle back the CPU. It also gives me good response when using other things. So I will let it run at 3 cores for now. With help from a family member, I went to the new Samsung Galaxy Note 10.1, 2014 Edition. I have lots of friends with Galaxy Notes, so when we get together we can have fun. It also works a ton faster than my old (handicapped) phone. Right now it's only running Pogs and of course WUProp, but I will move it around after this month to see how it works on some other projects.